Don’t you hate it when you search and search for that particular craft tool and just can’t find it. 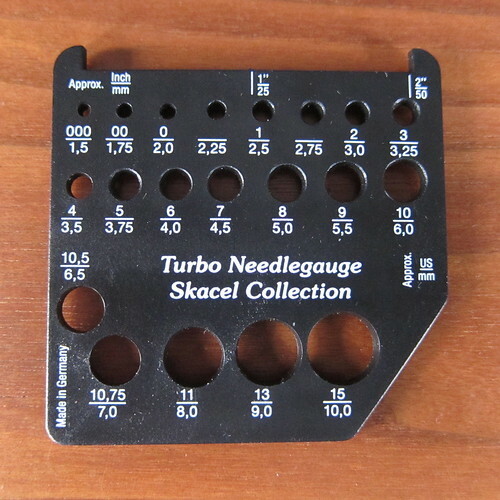 I’ve been looking for a knitting needle gauge that would measure needles smaller than a US 0. I have at least three pairs of needles that are smaller that I use for knitting toys and mittens, but no way to tell which size they each are. This is very frustrating when I’m trying to write up patterns. Then finally, this weekend I found one. Thank you Skacel! I was warned at the shop that if I had US needles it might not be exact, but it certainly gives me a much better idea what I’m using. I’m not sure why the US manufacturers don’t put those last two sizes on their guides. Do you have a tool you’ve been searching for? 6 years ago by Kat in Knitting , Needlecraft , Tools | You can follow any responses to this entry through the RSS feed. You can leave a response, or trackback from your own site.